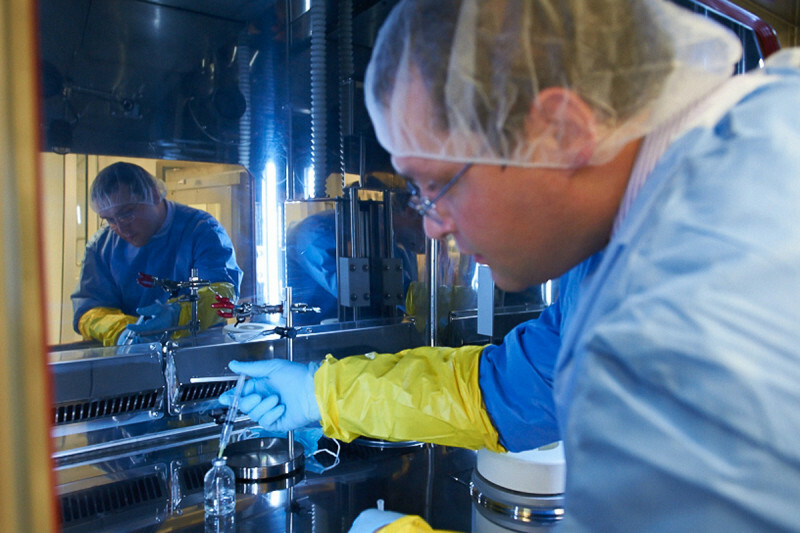 Radiopharmacist Serge Lyashchenko preparing a reagent in the cyclotron facility. Memorial Sloan Kettering has taken a leap into the future with the launch of a new cyclotron, a type of particle accelerator that will be used to produce radioactive molecules for PET imaging of cancers. The 44,000-pound instrument and the production facility built around it are expected to change the way our patients are diagnosed and treated by allowing doctors to examine and target tumors with increased precision. “This is truly a cutting-edge facility and one of the largest of its kind in the world,” says radiochemist Jason S. Lewis, who runs the cyclotron facility and also directs the recently established Center for Molecular Imaging and Nanotechnology. Affectionately nicknamed Dorothy, the machine was inaugurated during a festive ceremony on May 22. Speaking at the event, President and CEO Craig B. Thompson marveled at the tour de force of engineering and logistics required “to actually drop a 20-ton [cyclotron] through the middle of the hospital one weekend” in November and successfully install it in the basement while keeping the hospital fully operational. The method can be used to assess whether individual patients will benefit from a drug, monitor the drug’s effectiveness, or study its mechanism of action in a clinical trial. Other types of PET scans are used to diagnose and stage cancers by measuring tumors’ glucose uptake. In addition, PET is a vital tool for lab studies into the basic biology of cancers. Radioactive isotopes — the components of PET agents that make molecules visible in a patient — are produced in a cyclotron by hitting a nonradioactive molecule with a charged particle flying at extremely high speed, accelerated in a powerful magnetic field. Hospital cyclotrons produce almost no radioactive waste, and patients who undergo PET imaging are exposed to very low doses of radiation. There is another reason a new cyclotron was needed within Memorial Hospital: Our researchers are creating new medical technologies that require radioactive drugs to be produced and delivered to patients very quickly. But using the isotope in the clinic is challenging due to its short half-life — about 20 minutes — which is the time it takes for a freshly made batch of the isotope to decay until half of it is gone. “While the patient waits in the scanner, we make the isotope, take it off the cyclotron, couple it with a tracer or drug molecule, sterilize the product, and perform nine different tests to ensure optimal quality and safety,” Dr. Lewis says. The compound is then propelled to the imaging suite via one of seven pneumatic tubes that connect the cyclotron facility with clinical areas of the hospital. For carbon-11 and a number of other isotopes, this whole process must be done within minutes. Read of something similar several years ago, technology which would permit the cancers to be seen at a cellular level, for early diagnosis. The goverment issued a grant to use in this research, which would be available at Einstein's School of Medicine, as many facilities, such as MSKCC were greatly interested. Unsure how this progressed or what may have been learned from this project. Spoke with my Oncologist at Sloan, mentioned he was aware of this.